Isipathanaramaya Temple is one of the oldest Buddhist temples in Colombo, Sri Lanka. Located in Havelock Town it was built in 1916 by D.D. Why Isipathanaramaya Buddhist Temple is special ? Isipathanaramaya Buddhist Temple is one of the more recently built Buddhist temples in Colombo. The temple was built by D.D. Pedris in 1916 in memory of his fallen son, Henry Pedris, who was falsely accused and executed by the British for inciting racial riots. He was proven innocent later. As you enter the temple, you will come across a room full of relics and antiques related to Buddhism. A statue of the Hindu God, Lord Ganesha, is also placed at the entrance of the temple. 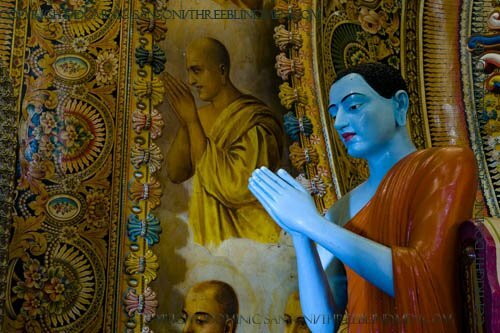 The temple has a good collection of Lord Buddha’s statues. The temple is a very peaceful place and also a reservoir of ancient relics of Buddhism. What to explore at Isipathanaramaya Buddhist Temple? Isipathanaramaya temple is a huge Sri lanka tours attractions in Colombo with few steps away from the intersections of Havelock and Dickmans road, Colombo 5. The temple is a magnificent place with colorful frescoes portraying the story of Lord Buddha on the walls and ceiling. The temple has Beautiful Buddha statues and a breath taking stupa with a glorious boa tree. It is a great place for peace and harmony of the mind as it takes you to a rather different world. A place well worth a visit in Sri lanka travels. How to get to Isipathanaramaya Buddhist Temple? Getting around by Tri-shaw (Three wheeler, tuk-tuk) is most convenient. Nowadays more three-wheelers are fitted with meters and it is always better to catch one with meter. These will have a Metered Taxi sign on the roof. In March 2015, the meter starts at LKR50, 4-5km should be around LKR200 and 6km should be around LKR250. As you enter the temple, you will come across a room full of relics and antiques related to Buddhism. The staff will provide cover-ups for bare shoulders and legs. You need to take your shoes off before entering the temple. It is close to the Isipathana boys school and right in front of the BRC club, Colombo 5. Isipathanaramaya Buddhist Temple is one of the more recently built Buddhist temples in Colombo. The temple was built by D.D. Pedris in 1916 in memory of his fallen son, Henry Pedris, who was falsely accused and executed by the British for inciting racial riots. He was proven innocent later. As you enter the temple, you will come across a room full of relics and antiques related to Buddhism. A statue of the Hindu God, Lord Ganesha, is also placed at the entrance of the temple. The temple has a good collection of Lord Buddha’s statues. The temple is a very peaceful place and also a reservoir of ancient relics of Buddhism.